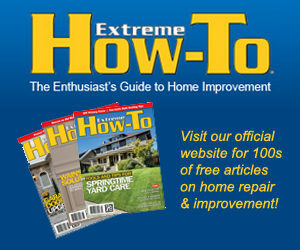 Extreme How-To’s Blog is a part of the Latitude3 Media Group. Extreme How-To utilizes its blog along with its other social network sites to better serve its readers and its advertisers. Note about submitting content: When it comes to “guest blog” posts, the Extreme How-To staff gets inundated with requests to submit material to us. We get a dozen emails each day from people who want to write for our blog. Before approaching us about sending your article, please familiarize yourself with our home page www.extremehowto.com to get a feel for the types of information we focus on. Frankly speaking, we aren’t interested in your “interior decorating tips” or “top storage ideas for the home.” We target experienced DIY homeowners and remodeling contractors, and our editorial focus favors project-centered stories, new technology, and skill-building advice for improving a house, inside and outside. We want unique content that we haven’t published yet and that we can’t readily find with a cursory search on Google. If you think you have what it takes, drop us a line and provide specific topic ideas you have in mind, but please understand that we are selective about what we publish.